Glass Curtain Walls, Storefront Glass and Glass Partitions are all non-structural, aesthetic glazings. 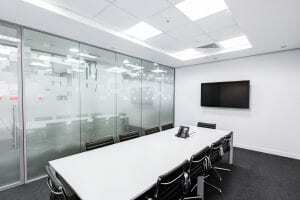 Consider glass curtain walls, storefront glass and glass partitions when modernizing a commercial retail or office space. Each of these modern glazing systems are energy efficient, non load-bearing aluminum framed functional options. There’s a level of sexiness and curb appeal that comes with an exceptionally designed space. Good design communicates not only to your customers and clients, but also to you and your employees. Consider the benefits of an office space designed around collaboration, cross pollination and interaction – one that eliminates hierarchy. What if your glass design presented an attractive image that invited customers and clients in to check you out? How might large glass panes that allow light to stream into the space effect the mood and overall feel of your space? What effect might these design choices have on everyone who interacts with your business? Glass partition walls are one of the simplest ways to update your space and incorporate your more modern taste. These offer huge advantages over traditional building materials like drywall. Not only do these systems improve the aesthetics of a given space, but they also promote co-worker connectivity and openness. These glass systems are gaining in popularity with interior designers for their scalability and translucent properties. When you allow natural light to flow into a given space, it changes how shapes, colors, patterns, textures and people interact. Despite their higher initial cost, glass partition walls are over time often more affordable than traditional building materials like drywall. These commercial glass systems are scalable, meaning that they can be reconfigured and moved to accommodate your widest array of needs. Sheetrock is a more permanent and often immovable fixture. Glass partition walls afford greater transparency. Not simply because they are glass, but because your customers, clients and employees can peer into them. This creates a greater feeling of openness and connectivity. Your customer’s first impression of your building depends on your storefront. A storefront with gleaming commercial glass doors communicates much more than what your business does, it communicates your tastes, aesthetic and who you are not only as a company, but as people. Updating your storefront glass makes a statement about your business and the type of clients you want to attract. Adding proper storefront glass may also increase the value of your building or space. In addition to its aesthetic advantages, installing a new glass front reduces energy and power costs. This can help keep your commercial space cooler in the summer and warmer in winter. Refreshed storefront doors instantly enhance the curb appeal and sexiness of your business or company. Properly installed glass results in long-term energy savings and energy efficiency. Using greater amounts of storefront glass allows more natural light to filter in and illuminate your retail space. 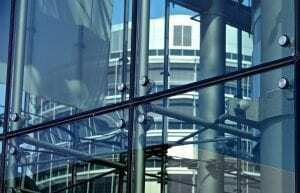 A glass curtain wall system is essentially a non-structural glass facade. This modern glass alternative is often a lightweight and often cost-effective solution to traditional building design and materials. This system is not load-bearing, meaning that doesn’t carry any dead load weight from the building other than its own dead load weight. The wall transfers horizontal wind loads that are incident upon it to the main building structure through connections at floors or columns of the building. A curtain wall is also particularly advantageous for use in Nevada as it resists air and water infiltration, sway induced by wind and seismic forces acting on the building. Curtain wall glass systems differ from other glazing systems in that they span multiple floors, and take into consideration design requirements. With several different designs and styles, curtain walls update the physical presence of any business. These systems are also available for your personal residence. Given its translucent nature, glass curtain wall systems allow for natural light to penetrate deeper into your office space or commercial storefront. Curtain walls are thermally efficient, which results in cost effective heating, cooling and lighting throughout your building. 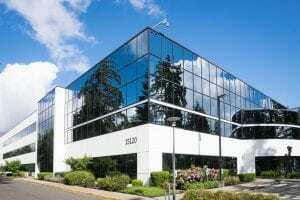 Curtain walls increase curb appeal and instantly modernize the look of your building or office space. Materials for glass curtain walls are often more cost effective and easier to install as opposed to traditional building materials and facades. We work closely with companies and business to help determine their window and glass installation needs. Ultimately we aim to offer you a wide range of commercial glass doors and windows including: storefront glass, glass curtain walls and glass partitions. We also handle custom sizing and specifications, with the experience you would expect from industry experts. Contact nvision Glass in Reno or nvision Glass in Las Vegas for more information or for a project estimate.